First of all, I would like to apologize for the quality of the photo, specifically the glare. I am not a photographer and especially on occasions like this evening where 8 different Champagnes of this caliber were pulled out of the cellar by our most gracious host, I got so excited that my photography suffered even more! On to the information which is, after all, why you are reading this! Thanks again to The Wine Doctor, which is where I found the most amount of useful information about Egly-Ouriet to add to my own. A Récoltant-Manipulant (RM), Egly-Ouriet is considered by many, and myself, to be one of the finest growers in Champagne today. Located in Ambonnay in the Montagne de Reims, they farm about 8ha of vines, all of which are Grand Cru. 75% of the vineyards are Pinot Noir, 25% Chardonnay and the average age of the vines is 35 years. In addition, he also owns a small plot of Pinot Meunier (not Grand Cru) in Vrigny which he bottles separately as the Vignes de Vrigny NV. In recent years, Egly has reduced the use of chemical fertilizers, herbicides and pesticides and he aggressively green harvests during the summer to control yields. In the winery, he is one of the few in Champagne to ferment in Oak. His wines are never fined or filter before being bottled for the second fermentation. Sulfur use is minimal. He practices long lees aging, up to 10 years on the 1996 Magnum. Low dosage is a trait, along with the date of Dégorgement (The process of freezing and removing the end of the bottle to extract sediment after the second fermentation of a sparkling wine) on the back label. 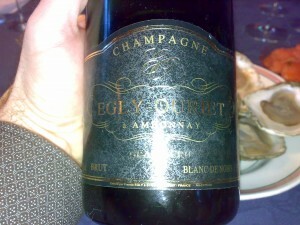 Egly-Ouriet also makes an Ambonnay Rouge. A 100% Pinot Noir still wine. I have had the opportunity to taste the 1998 and I thought that it was an extremely good effort. I tasted this wine in 2008 and although the oak was still dominant, the character of the oak was not offensive and the wine was quite fresh. I remember sweet cherries, minerality and good acidity and balance with a long finish. It was drinking quite well at the time, but could spend a few more years in the cellar for the oak character to soften a bit. On to the Cuvée Speciale! According to the Norwegian importer for Egly, this was most likely an experiment for Egly-Ouriet. It was only made in two vintages, 1997 and 1998, and few bottles were made. Although the vintage on this wine is not stated on the label, it is a single vintage. This was the 1997 vintage. Date of Dégorgement was 2002, so it spent about 48 months on the lees. This wine was aged for approximately 10 months in 100% new french barriques. 100% Pinot Noir. Appearance: a bit darker than the other Champagnes in it’s company. It appeared to be a bit older than it actually was. Nose: the first aromas that were present for me were the mushrooms. My initial impression was that it may have been slightly over it’s peek. Aromas of yeast and minerals also showing along with the somewhat muted fruit. Palate: a very mellow attack and first impression. Quite fresh, at least fresher than the nose would have indicated. Yeasty with mellow with persistent acidity. Oak still dominant. Mushroom character also on the palate. Overall, this Champagne did not impress me. I will admit, there was some heavy competition this evening but based on my knowledge and past experience with other Egly-Ouriet’s, this is my least favorite Cuvée. Although it was rich and yeasty, an Egly trademark for me, it lacked the backbone of freshness I have come expect from Egly and I think this Champagne may have been past it’s prime.